Cleveland Museum, Fifty Years of Modern Art, June-July 1966, no. 124 (illustrated). New York, Solomon R. Guggenheim Museum, Joseph Cornell, May-June 1967. Chicago, Museum of Contemporary Art, Cornell in Chicago, November 1973-January 1974. New York, Museum of Modern Art and Art Institute of Chicago, Joseph Cornell, November 1980-March 1982, no. 163 (illustrated). "Cornell was intrigued with magicians and as a self-taught wizard of the art of illusions, he probably identified with the Grand Owl. A night owl himself, Cornell often worked in his studio during the wee hours. He was fascinated by the owls' hooting calls on his nature walks...and by the dioramas at New York's Museum of Natural History." An amateur naturalist and avid bird watcher, "the intimate mysteries of Nature's theater" fascinated Joseph Cornell (J. Cornell, quoted in L. R. Hartigan, "Habitats," Joseph Cornell ShadowplayEterniday, New York, 2003, p. 116). Forming a distinct group of his birdhouse constructions or Aviaries, the Owl Boxes-along with the inclusion of several other woodland birds and animals-form the base for Cornell's Habitat or Natural History boxes. 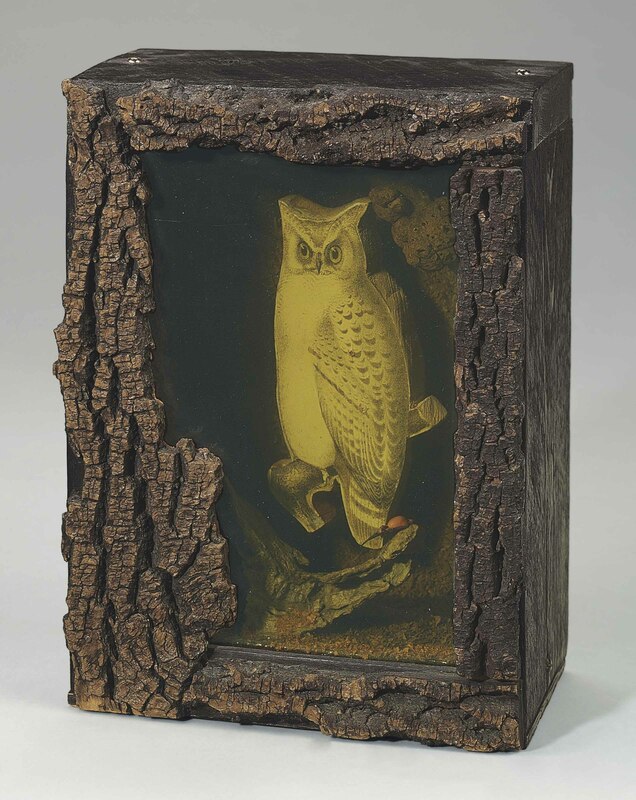 Poetically described by Cornell himself, on the occasion of his 1948 solo-exhibition at the Copley Gallery in California, the mysterious owl box was, for its creator, "a habitat with secrets" (J. Cornell, quoted in D. Ades, Surrealist Art: The Lindy and Edwin Bergman Collection at the Art Institute of Chicago, New York, 1997, p. 53). And while the artist relied on illustrations from engravings and books-going so far as to cut up valuable early nineteenth-century editions of Alexander Wilson's American Ornithology and John James Audobon's The Birds of America-the natural quality of the dark, mysterious and arboreal boxes distinguish the Habitats from his more common Aviaries. "The many trips made by bicycle gathering, dried grasses of different kinds, the fantastic aspect of arriving home almost hidden on the vehicle by the loads piled highthe transcendent experiences of threshing in the cellar, stripping the stalks onto newspapers, the sifting of the dried seeds, then the pulverizing by hand and storing in boxesThese final siftings were used for habitat (imaginative) boxes of birds, principally owls. The boxes were given a coating of glue on the inside then the grass dust thrown in and shaken around until all the sides had an even coating to give them the aspect of a tree-trunk or nest interior" (J. Cornell, quoted in ibid., p. 54). Powerfully evocative of Cornell's childhood, these finds of country flotsam reminded the artist of his lost American countryside, and an even more distant past. However, the strong sense of contained arrangements of both natural specimens and man-made artifacts, such as book engravings and plastic insects, suggest that the Habitats are not solely interpretations of the "ethereal magic of simplicity in the commonest aspects of Nature" (J. Cornell, quoted in L. R. Hartigan, "Habitats," op cit., p. 205). Also known as his Natural History construction, the juxtaposition of the organic and artificial recalls the dioramas at New York's Museum of Natural history, where Cornell frequently visited. Working with these natural materials, the artist thought of himself "working like an herbalist of apothecary of old with these sweet scents in my own fusion" (J. Cornell, quoted in D. Ades, op. Cit., p. 54). Indeed, since antiquity, owls have garnered numerous associations from wisdom to death. While in Greek and Roman mythology the owls of Athena and Minerva, respectively, stood as the classic symbols of wisdom, they also belonged in a similar sense to the alchemists, which were of close relation to the apothecaries with whom Cornell identified. Bringing us into the world of this majestic nocturnal bird, Cornell's Owl Boxes are at once transfixed by the secrets of the moon and the mystery of the forest.